Sarik told me that he and his team produced the figurine themselves, on site, using a 3D printer. The technology that powers these machines, which allow users to create physical objects from digital designs, threatens to disrupt traditional manufacturing the way MP3 and peer-to-peer file sharing have disrupted the media business over the past decade. Touring CLUE with Sarik, I saw a room full of complicated and unfamiliar and gadgets. I had to wear goggles and leave my cell phone outside. To an outsider, CLUE looked noisy. It was a cacophony of stuff. It was unclear where one workstation or piece of technology ended and where another began. But for the CLUE engineers, everything was in its right place. Chaos blissfully organized. Indicative of its mysteriousness, CLUE's logo is simply a question mark. 3D printing remains intangible to most people, and yet the rush to regulate it has begun. But experts are warning lawmakers that haphazard regulation could potentially do more harm than the technology itself. A classic ink-jet desktop printer reads information from a digital document, for example a Microsoft Word file, and prints the formatted text in ink, line by line, onto paper. A 3D printer interprets computer aided design (CAD) files -- three-dimensional schematics used by engineers since the 1980s -- and builds objects up layer-by-layer out of plastic, metal, or in principle any other material. The technology holds out the promise that anyone, anywhere, can create anything. The printers can be used to produce low-cost replacement parts for appliances, tools, from dishwashers to aircraft. They are being used for medical prosthetics, and even, experimentally, for building actual biological organs out of organic material. What one can't do -- legally -- is print out a toy that depicts Han Solo frozen in carbonite. The character is part of an original work, the Star Wars films, and is therefore protected by a copyright owned by the studio that produced it, Lucasfilm Ltd. The right applies automatically and gives Lucasfilm the right to sue violators for a period that extends until 70 years after the death of the work's creator, filmmaker George Lucas. "When you're faced with digital disruption you can certainly spend a lot of time and a lot of money and a lot of resources trying to sue everyone and to stop them from using this new technology," said Michael Weinberg, Vice President of Public Knowledge, a free-internet advocacy group. This is just what the music and movie industries did when confronted by the advent of the MP3 compression format for music files along peer-to-peer file sharing networks on which to copy and exchange them. But in the case of 3D printing, it is not entirely clear who they would sue. The Recording Industry Association of America (RIAA) spent a decade suing individual file-sharers, only to give the practice up in the face of evident failure and public outrage. Jane Ginsburg, a copyright expert at Columbia Law School, said manufactures will likely avoid replicating the RIAA's approach. "Big companies are unlikely to go after end users," she said, because the scale of the litigation would be too small and would be likely to produce a backlash. The music industry had more courtroom success against Napster, an online service that centralized the wide and rapid distribution of illegally copied music file. The website Thingiverse, where Sarik found the CAD file he used to create the Han Solo toy, is 3D printing's closest analogue to Napster. "If history is any guide, there would be a much stronger effort to try to target all the sites that make available the 3D plans," said Tim Wu, a professor at Columbia Law School and author of The Master Switch. But Wu also said there were limits to the analogy. Copyright protects original, artistic and non-useful works. While this definition covers most of the MP3s on Napster, it excludes most of the content on Thingiverse; the Han Solo toy is actually an exception. Most 3D-printed objects -- and most of the digital designs they are derived from -- are not protected under current law. Creating objects for personal use is fair game, as is 'remixing' copyrighted forms--say, a figurine of Barack Obama frozen in carbonite. Sites that host user-generated content, as Thingiverse does, operate under a 'safe harbor' provision in the Digital Millennium Copyright Act (DCMA). The DMCA set up a notice and takedown system, dictating that content holders, and not content hosts, are responsible for monitoring infringement--an arrangement that SOPA and PIPA tried to reverse. Intermediaries like Thingiverse, as safe harbors, "don't have a duty to police their websites," said Ginsburg, and are not directly liable for infringing content on their sites so long as they address takedown request expeditiously. While Thingiverse cannot be saddled with liability as long as there are sufficient non-infringing uses for its platform, "this Supreme Court has not defined sufficient non-infringing use," warns Ginsburg, whose mother, Ruth Bader Ginsburg, serves on the Court. "Is it 50% [of the website's content]? Is it 30%?" If resolved in court, the answer to this question will have a large impact on the legal viability of online platforms hosting CAD designs. "The reason we have Facebook, the reason we have Twitter, the reason we have YouTube, the reason we have Thingiverse is there are these safe harbors that websites, as long as they follow the rules, know they won't be held responsible," said Weinburg. This is no guarantee of long term protection. "There will be some industries that decide that the best way to adapt is to come to Washington and try and get the laws changed instead of recognizing reality," said Weinberg. One type of file you can't won't find on Thingiverse, at least since December 2012, are designs for firearms. Cody Wilson, 3D-printed gun activist and founder of Defense Distributed, said Thingiverse amounts to no more than "hipsters selling toys." Wilson. The 25-year-old University of Texas at Austin law student has made his name by being the first to produce usable AR-15 rifle components and demo-firing them himself on his popular Youtube channel. 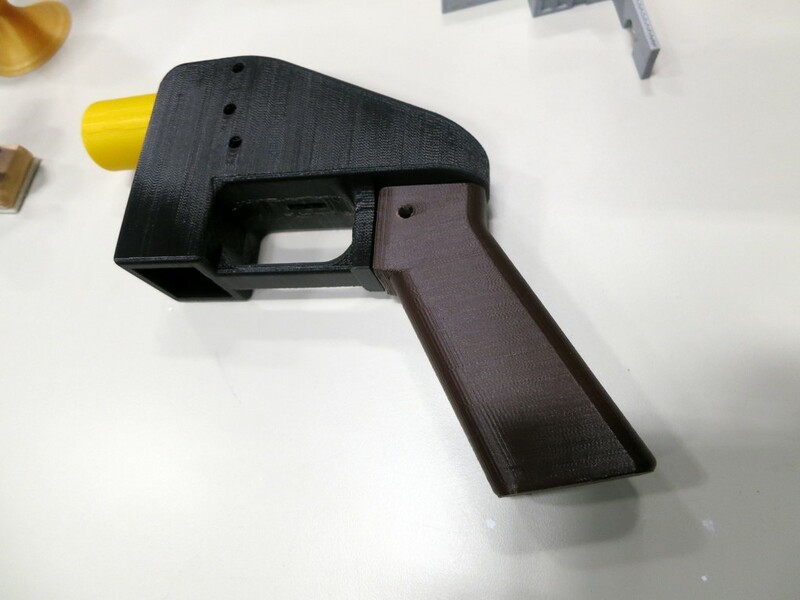 In May 2013, Defense Distributed designed, manufactured, and tested the world's first fully printable firearm, the 'Liberator' pistol (pictured below). The backlash among lawmakers has been swift. Representative Steve Israel (D-NY) introduced legislation earlier this year that would extend the Undetectable Firearms Act of 1988 to specifically include target 3D-printed guns. On November 21st, Philadelphia became the first city to ban the manufacture of printable firearms--even though none have yet turned up in the city. "They're working on literally any choke point they can find," said Wilson. The activist, who styles himself a 'crypto-anarchist,' sees these moves as the desperate acts of uncomprehending paternalists bent on curtailing personal freedom. Wilson said it would be impossible to stop Defense Distributed without threatening 3D printing in general. "And that was the goal," he said, "to basically make people recognize the kind of civil liberties you're going to lose if you want to stop us." Weinburg and other 3D-printing activists agree. "I hope that people will take time to really think" before regulating 3D printed guns, he said. "It turns out that from a regulatory standpoint, from a policy standpoint, there's nothing really new about people being able to or actually making high precision firearms at home," said Weinburg. In fact, last March, Wilson successfully applied to the Bureau of Alcohol, Tobocco and Firearms to become a federally licensed gun manufacturer. Weinberg's organization, Public Knowledge, has told lawmakers "if you care about undetectable firearms, outlaw undetectable firearms. Don't focus on specific technology." The group supports an alternate proposal put forward by Sen. Charles Schumer (D-NY) that would modify existing law without touching on 3D printing specifically. Banning 3D-printed guns instead of undetectable guns would cause "a lot of collateral damage without any real policy benefit," said Weinberg. Ginsburg said the most likely regulatory outcome is similar to DMCA's takedown-notice-based system. But, she said, it's also possible that "industries that are currently not protected" -- traditional manufactures -- might try to convince Congress to expand copyright rules the way SOPA and PIPA were meant to. "I hope that all of these industries, when faced with 3D printing, would say 'let's adapt to this," said Weinberg. The more laissez-faire approach -- a version of which Wu, Ginsberg and Wilson all favor -- requires the acceptance of some amount of risk and uncertainty. The technology promises breathtaking possibilities for both innovation and disruption. "Everything is going to be scanned and it's all going to be uploaded so it's just a matter of finding who's got the iPhone schematics out there and stopping them," Wilson said. For Weinberg, while Congress and the courts should think of 3D printing more in terms of continuity than change, the technology will force successful manufacturing companies to revolutionize how they do business. "For better or worse, it's the only option," he said, "he history of the Internet has taught us that you have to make the change. You can accept that early or you can accept that late but that's what you have to do."